MOVING DAY IS HERE: ARE YOUR APPLIANCES READY TO GO? From across town or across the country, the majority of people have experienced at least one address change in their lifetime. If your new home doesn’t come with appliances installed, moving yours can seem like a daunting task. In order for your appliances to arrive at the new house undamaged and ready to use, you need to properly prepare them for the move. When packing smaller appliances, such as a microwave, or parts of larger appliances, use newspaper, towels or linens to fill in the empty space. Packing peanuts may get into the machines and cause damage. 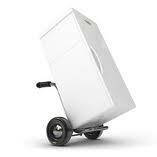 Unplug your refrigerator at least 24 hours prior to moving it. If your unit has an icemaker, contact a professional to disconnect the water line. Remove all items and defrost the freezer before thoroughly cleaning the inside. Allow it to dry completely to prevent mildew. Remove all shelving and drawers to prevent them from cracking during the move. If you have a gas stove, contact a professional to disconnect the gas line. Make sure both the top of the stove and inside of the oven are completely clean. Remove the racks from inside. Make sure all parts that can come off, such as knobs and removable burners, are either secured to the stove or removed and placed together in a box. To clean the dishwasher, run an empty load with one cup of white vinegar. Remove and pack the utensil holder separately, then tape the door closed. Consult the owner’s manual for moving instructions. Contact a professional to remove the hoses, then pack them separately in another box. For recipes, appliance and energy tips, follow us on Twitter @MrApplianceCorp, like us on Facebook at www.facebook.com/MrApplianceCorp and follow our boards on Pinterest at www.pinterest.com/MrApplianceCorp. its good to see this type of blog here i m looking for this service from a long. I am planning on moving all of my restaurant appliances in Vancouver and I really appreciate your tips and suggestions. This was a great post.